Submitted by cadyjacob on November 19, 2010 - 12:49pm. 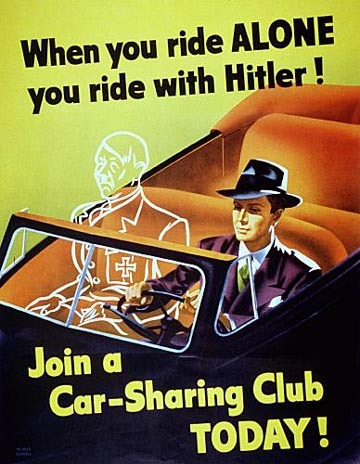 "When you ride ALONE you ride with Hitler!" This gets across the message citizens that oil and rubber where scarce commodities, and driving alone was essentially taking these resources away from soldiers. Illustrated by Weimer Pursell in 1943. "Have you REALLY tried to save gas..?" This 1944 poster by Harold Von Schmidt follows the Uncle Sam model of impressing a message on citizens, showing the disappointed face of a US soldier looking upset at your lack of efforts to conserve his gasoline. Was World War II The First Conservation Movement? In the 1940's an enormous conservation movement began to spread across the nation, driven by the US Government who sought to sustain both the nation and it's armies during wartime food and material shortages. 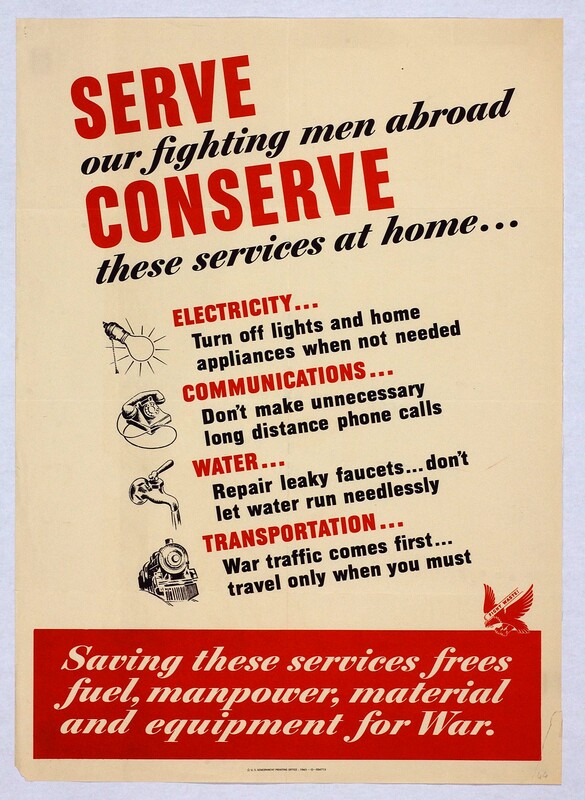 The ad-campaign behind the wartime conservation movement sought to both instruct and inspire each citizen, with vivid, powerful messages of the dire need for every individual to take action. 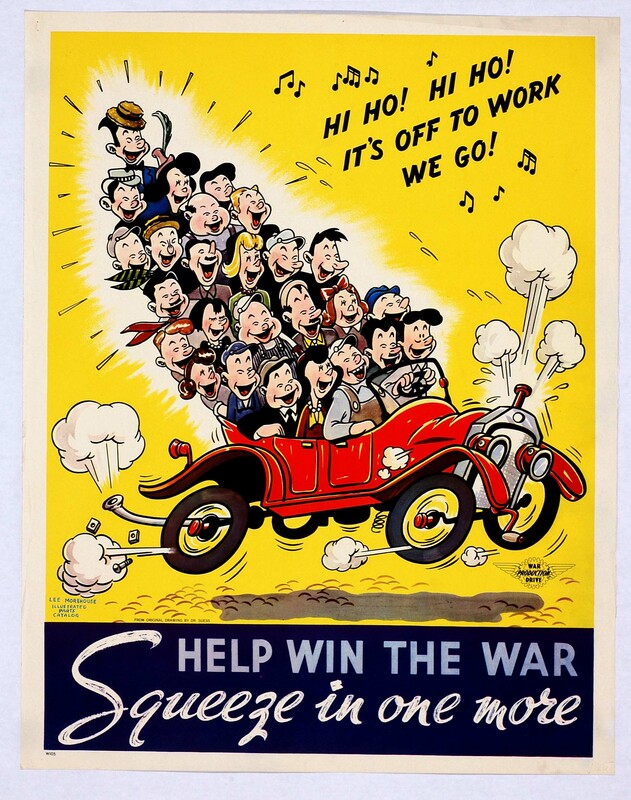 A more joyful outlook on carpooling, this poster was a team effort to promote carpooling by Morehouse, Lee, and Dr. Seuss! "Hitler Rides in the Empty Seat"
Using the enemy as a very up close and personal reason not to ride alone, this driver is Hitler's chauffeur. "Carry more to win the war!" Again, making sacrifices for those who are sacrificing much more was a poignant way to connect the need for conservation to the action of carpooling. Published by the U.S. Government printing office in 1943, this poster lists key ways to economize and save. "..Shine a torch on your hand!" This poster, by Hans Schleger, was published by the London Transportation Department. It communicates a very crucial message: during the war the entire city would be in a "blackout" in order to hide from enemy planes, and this would be the only way to signal a car or bus without alerting your presence to the enemy above. Illustrated by Glenn Stuart Pearce in the early 40's, this poster was commissioned by the WPA Federal Art Project in Philadelphia. Big industry war production needed vast amounts of resources, and the only way to conserve was to thoroughly convince citizen's of their role in responsibly conserving the resources. "Save Waste Fats for Explosives!" This poster was printed in 1943 by the Office of War Information, and was illustrated by Henry Koerner. No more pouring bacon grease down the drain..
During WWII, the distribution of goods and scarcity of commodities led to rationing and food stamps. Each family was given enough stamps for an allotted amount of bread, sugar, and butter, and were told to make it last. 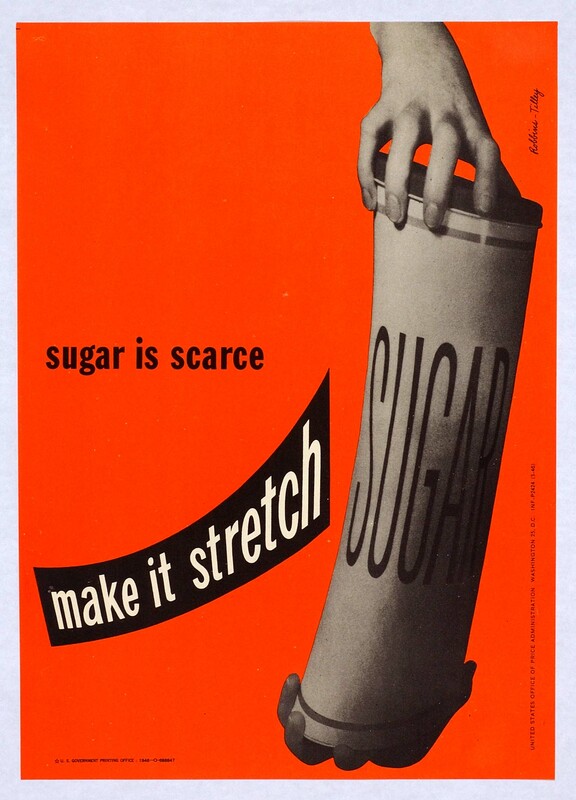 This poster was printed in 1946 by the Office of Price administration, and was designed by Robbins and Tilley. "Fruit you waste here may prevent his wounds healing there!" This somewhat melodramatic poster is one of many promoting the high vitamin content of fruit, and encouraging families to grow their own fruits and vegetables. It is from the National Archives at College Park, MD. 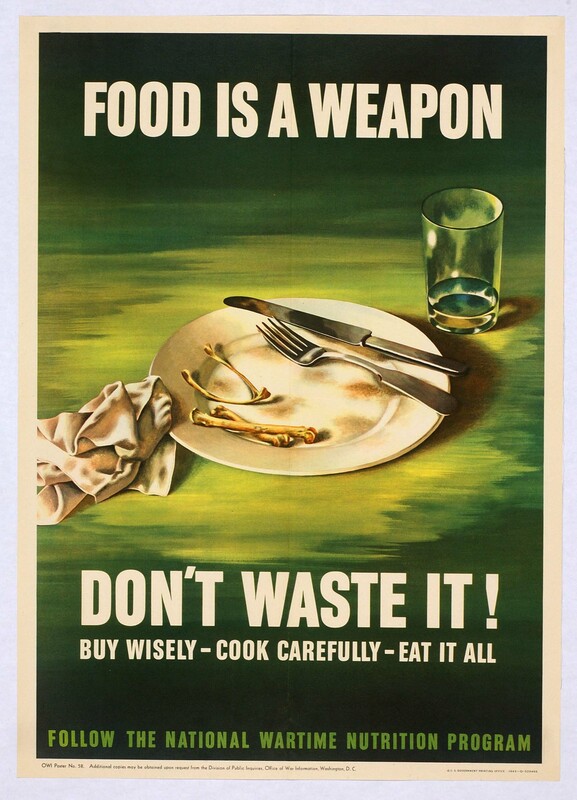 Wartime conservation brought on a new consciousness about nutrition, consumption, and preservation, something that was subsequently lost from the public sphere in the following decades of affluence. This piece was printed by the U.S. Government Printing Office in 1943, and was distributed by the Office of Wartime Information. 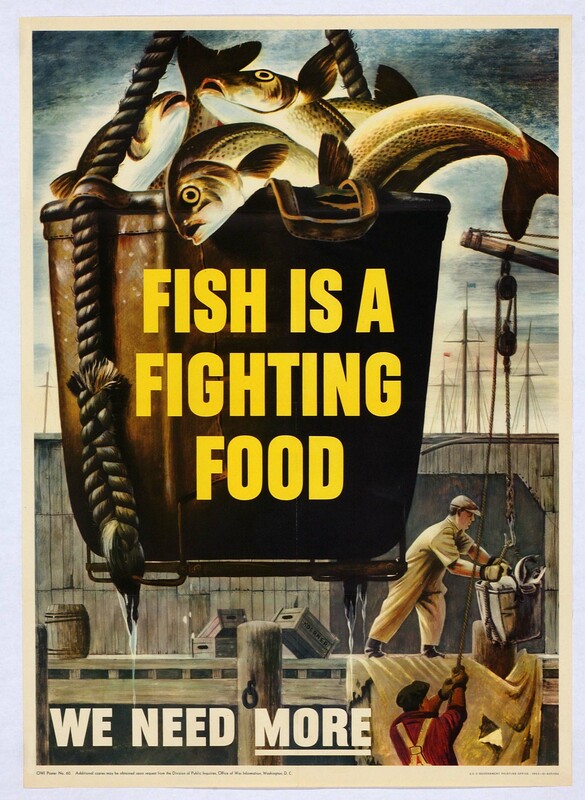 "Fish is a Fighting Food"
Distributed by the Office of War, this 1943 Koerner poster sought to educate citizens on the benefits of eating self-sustaining food, for the same reasons that led the government to lobby heavily behind gardens and harvests and canning. Self-sufficiency was key to maximizing the amount of materials the nation would have to support the war. Though now it seems silly to have propaganda about eating more fish, it was extremely pertinent at the time. Canning - "A Real War Job"
This poster was published by the Office of War Information in 1943, and it also promotes individual responsibility for sustenence, and tries to inspire people to do their duty and can their own. This poster, published in 1944, was a part of a series promoting gardening as a responsible method of fighting the war from your own backyard, by essentially giving your allotted resources to those in more dire need. Aluminum was a valuable commodity, and wartime metal drives were a common way for people from the community to band together and accumulate vast amounts of metal to recycle for the troops, using everything from tin cans, to pots and pans, even the insides of wheels. This particular poster shows a woman's hand feeding the guns of the troops through her soup cans, giving individual responsibility to housewives. It was illustrated by McClelland Barclay, and was printed in 1943. This poster image of patriotic recycling by Granger gave a new sense of purpose to reusing waste.